For a space project we have to make sure that things are not failing while our hardware orbits around the Mother Earth. Therefore we are using different static and dynamic analysis tools, and one of it is using PC-lint from Gimpel to catch as many errors and bugs as possible. For that project, we are using Eclipse with the GNU ARM Embedded (launchpad) ARM compiler and Eclipse as IDE with the GNU ARM Eclipse plugins. There are commercial plugins available for linting with Eclipse (e.g. Linticator), but with a few tweaks it is possible to lint with Eclipse free-of-charge. So this article is about how to lint an Eclipse (Freescale/NXP Kinetis Design Studio) project with PC-Lint. If you are serious about software development, you want to check your source code as much and as early as possible. A tool I have used for a very long time is PC-lint from Gimpel (. It is not a free tool (costs around $390) but it has saved me countless hours so far. There are open source alternatives which I’m using in parallel, but still PC-lint is a kind of reference for me. For Linux users there is a version for that host operating system too. The challenge with fully using PC-lint is to make it aware of all the library include path and settings, plus to make it aware of all the compiler built-in defines to properly lint code with libraries. This post should help you to solve that challenge :-). You might check out one of my early articles about how to lint with Eclipse without a plugin (see https://mcuoneclipse.com/2012/04/10/linting-without-a-plugin/). Since then, things on the Eclipse side has been changed a bit. This post has improved error handling and shows how to use it with the GNU ARM Embedded (launchpad) tools including properly including the libraries. In my earlier linted projects, I have used co-gnu.lnt. GCC versions 2.95.3 and later. commentary at the top of co-gcc.mak. -cgnu // Notifies FlexeLint that gcc is being used. // s-char-sequence, but currently Lint ignores them. +libh(co-gcc.h) // Marks that header as library code. // and should be generated by invoking gcc with its '-v' option. // This happens automatically when 'make -f co-gcc.mak' is invoked. // -a#machine(i386) // #assert's machine(i386) (SVR4 facility). // happens automatically when 'make -f co-gcc.mak' is invoked. ++dconst=const // ensure const expands to const. // re-enabled immediately after the semicolon in '__asm__(...);'. // or near assembly regions, please let us know! // GNU statement-expressions wrapped in __extension__(). +rw(_to_semi) // needed for the two macros above. +rw( __complex__, __real__, __imag__ ) // reserved words that can be ignored. // are actually linting library headers. -elib(123) // 123 is really a warning, but it's in the &quot;Error&quot; range. -elibsym(628) // Suppress 628 for __builtin symbols. // The following functions exhibit variable return modes. // Warning 534 for these functions. // Feel free to add to or subtract from this list. // for functions known to have variable argument lists. // For ANSI compilers, header files should take care of this. -esym(746,*__builtin*) // declared and it knows their prototypes. As both files depend on the compiler installation path and compiler options, these files are *not* part of the PC-lint installation. Instead, they have to be created. In the next sections I describe how to create these to files. You might skip the creation steps and directly use and adopt my generated files instead. 💡 I had to run the setup version of the GNU core utilities, as otherwise the tools reported some missing DLL files on Windows :-(. The size-options.lint file shall be created with a small executable (that step will fail, we will see). @REM note that the last step will fail (to link and execute the file for the type sizes). This is expected. You will need to adopt the path settings to match make, awk, gnu core utilities and GNU gcc installation on your system. 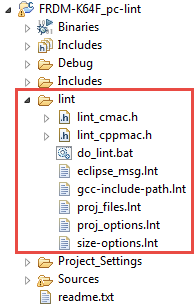 The other consideration is that the gcc called with that make file should match the compiler settings used in the Eclipse project to be linted, as the .lnt files produced need to match the compiler settings used. 💡 You can take above template and easily adopt to your compiler version and installation path. The generated lint_cmac.h and lint_cppmac.h contain all the predefined macros of the gcc compiler. lint_cmac.h, lint_cppmac.h, gcc-include-path.lnt and size-options.lnt are the files from the previous step. // since we have only the default eclipse error parser available. // Enable warning 831 if you are interested. I was thinking about an extra step to generate the list of files automatically. But at the end it was simpler and easier to maintain that list by hand. And I can simply comment lines to only do a partial lint run. With that build command I’m calling the batch file (do_lint.bat) from the previous step. 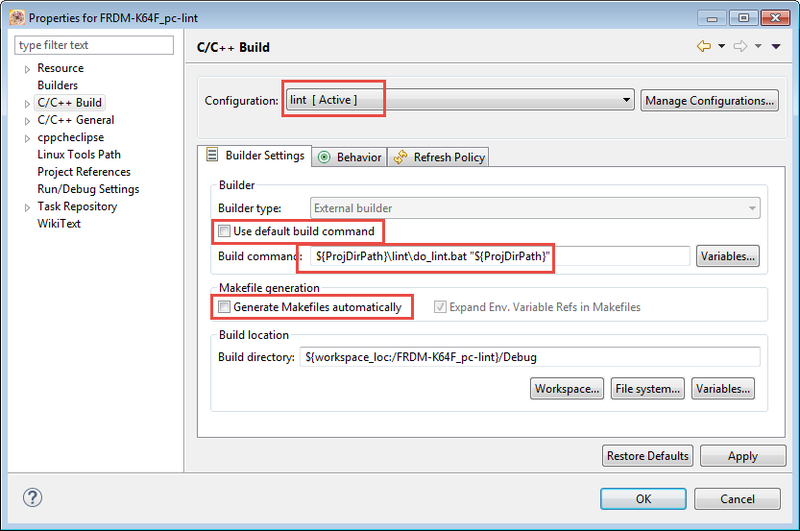 As argument I pass the project path to it with the Eclipse $ProjDirPath variable. Linting project files is a valuable way for me to increase software quality (lint early and often). I have been deliquent for a while not doing it often recently, but that space project reminded me to start this good habit again, even if it takes some time to do it. 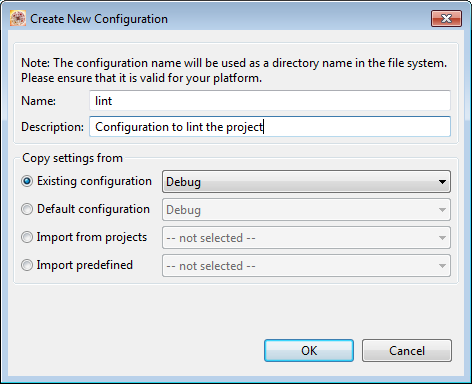 To use lint with Eclipse projects is not straight-forward at the beginning, but with some infrastructure and getting used to it, it is very easy. And I hope this article motivates others to use lint more. PC-lint is not free, but it might be very worthwile. Otherwise I hope the above setup can help as well with other similiar tools. This entry was posted in ARM, CPU's, Eclipse, Embedded, Tips & Tricks and tagged arm gcc, Building, Eclipse, gnu gcc, lint, open source projects, pc-lint, software, software project, technology, Tips&Tricks, tool chains by Erich Styger. Bookmark the permalink. always great to read you posts! what is your experience with free lint tools like cppcheck, splint? have you done any experiments with the clang static analyzer ? yes, I’m using cppcheck too, with good results (see https://mcuoneclipse.com/2015/07/02/open-source-static-code-analysis-cppcheck-with-eclipse/). I often use cppcheck in my codes, it’s also a good tool! Standard C is a pretty bad starting point for anything where high reliability is involved. Why aren’t you using a well proven starting point, e.g. SPARK Ada or MISRA-C? Hi Tom, using something like Ada was out of scope/question. We can all agree that C is not the best language in the world for this kind of things, but on the other side it is a reality. On the other side: this is a scientific space project, so the bar is not as high as for other high reliability systems. And PC-Lint is used as MISRA checker in this project. MISRA-C isn’t about the *tool* used to indicate compliance, it is about the *rules* that indicate compliance. If your use of PC-Lint provides all the benefits of MISRA-C then that is sufficient; if not then potentially MISRA-C is better. As for “on the other side is reality”, that is a very weak justification for a course of action. Sometimes the best course of action is to walk away and not do it! Naturally I cannot make that judgement for your case, nor can I judge your use of your tools for your problem. Gimpel has a version for Linux, including for Mac OS X (http://www.gimpel.com/html/flex.htm), it is named FlexeLint. We are still using KDS 2.0. Any advise before we try adding Lint to KDS version 2.0? pretty much the same approach should work with KDS v2.0. Only that that has a different compiler. Any reasons why you are on V2.0 because the V3.x is much better? We started with 2.0 and have done all out validation and testing with 2.0. There is no way we can switch at this point. However, we will be looking at whatever KDS version is current when we start our next cycle. I could install KSD 3.0 and look at the source and apply any changes as needed. Is there known issues with having 2.0 and 3.0 installed on one computer? Go directly to KDS V3.2.0, as this one includes all updates in KDS V3.x.x. And no issues known on my side for this one, you can install it side-by-side with KDS v2.0, so you do not need to uninstall 2.x or 3.x. Unfortunately, I just found out PC-Lint no longer offers a free trial and my current company does not currently have a Lint license. Well just another round of paper work! I went to KDS 3.2 and followed the Migrating KDS V2 to KDS 3 guide. I get the following error when linking. I remove the list of *.o files because of the length. Any ideas? to the linker options. This will disable semihosting which I think is causing your problem. I went back and looked at the conversion report and found no error. I have “other linker flags” set to “–specs=nosys.specs” and Use newlib-nano (–specs=nano.specs) checked. I still get the same error. Toolchain settings, for configuration Debug: successfully converted. Newlib-nano, for configuration Debug: successfully converted. Toolchain settings, for configuration Release: successfully converted. Newlib-nano, for configuration Release: successfully converted. Add _exit(): /Sources/exit.c, was added. This is what it took to get my build working. 1. Clean set of code from VCS. 2. Run KDS upgrade assistant. 3. Add “–specs=nosys.specs” to other linker flags. I’m really wondering why step 2 (Run KDS upgrade assistant) was necessary? The original project is current a KDS 2.0. Not sure if it is necessary, but the other programmer who worked on this did not do this and kept finding linker errors. Based on his work and your comments this is what works. I’m not sure if linting will work the same way for KDS v2.0 (v2.0 this is a old/outdated version anyway). For sure it will require different include paths as the GNU toolchain in KDS V2.0 is not the original one from ARM/launchpad. As part of looking at moving to KDS 3.X for the next iteration of our project, I want to add stack depth checking. It should be simple but I do not see a clean way. Any suggestions on a good way to access the stack pointer? that would depend what you mean with ‘stack’ check. See https://mcuoneclipse.com/2015/08/21/gnu-static-stack-usage-analysis/ how you can check the stack in a static way. If you are using FreeRTOS, it has stack checking and reporting built in. If you want to access the stack pointer anywhere from your application: write a piece of assembly code to push/pull the MSP or PSP (on ARM). For other architectures it is similar. I will work on this shortly. Do you have a recommended reference material. I have experience on several MCU just not arm. I have not seen any reference material except the information on http://www.gimpel.com, this was the reason to write these articles around PC-Lint. unfortunately WordPress frequently is affecting posted source code :-(. I recommend you copy from the GitHub project (https://github.com/ErichStyger/mcuoneclipse/tree/master/Examples/KDS/FRDM-K64F120M/FRDM-K64F_pc-lint/lint) instead. Extremely helpful article! Thank you for putting it all together. I am using Lint V9.00 from 2012 and trying to get this to work with KDS 3.2.0. It is failing on the first line of the co-gcc.lnt. I am stumped in terms of what is going on. Do you have any suggestions? I’m using 9.00i but that should not matter I think. Does it work for you with my unchanged project GitHub (https://github.com/ErichStyger/mcuoneclipse/tree/master/Examples/KDS/FRDM-K64F120M/FRDM-K64F_pc-lint)? Of yourse you should update the path to the lint executable/batch file. I don’t have such a co-gcc.lnt file in my lint folder there? That file is part of my lint installation. Anyway, I have now added my version to the git project.